As part of So and So Arts Club’s Women and War Festival, American playwright and former professor at the American University in Cairo Tom Coash’s two-hander, Veils, explores the emotionally charged question of whether the wearing of the veil oppresses or empowers women against the backdrop of the Arab Spring. 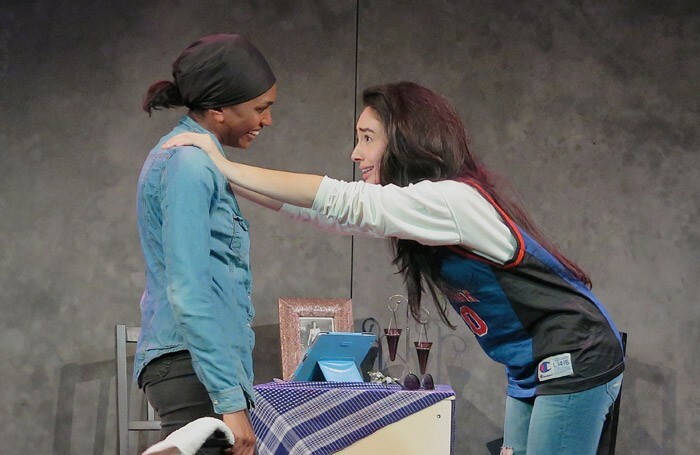 Coash’s play captures the repartee of young women unusually well and offers a clever dismantling of eastern and western stereotypes. The bubbly, alcopop-drinking Alexandrian Samar, doesn’t wear a head covering, whilst the quieter, studious West Philly-native Intisar has worn a hijab since adolescence. Following a movement to ban the niqab on campus, the roommates set out to demystify the veil by vlogging both sides of the debate. Intisar’s measured analysis is juxtaposed with Samar’s emotional response to political tyranny, terrified at the thought of an Egypt where women are covered up inch by inch. Pamela Schermann’s animated production is spearheaded by two thoroughly engaging performances by Isaura Barbe-Brown and Zelina Ribeiro, who beautifully illuminate the way in which friendship can be tested and even strengthened across ideological differences. Several years on from this play’s debut, the consequences of the Arab Spring are still difficult to define. Through these characters, both interpretations of the veil are equally valid. Each woman’s right to choose how she wants to present herself is beautifully encapsulated in Samar’s parting line to her friend: “I hope I am never forced to wear the veil and that you are never forced to take it off” as she heads into an enraged crowd and a turbulent future.